Christmas is a time to catch up with family and friends or get together socially with work colleagues. If you’re already starting to think about Christmas 2019 then we are all set and ready to help you plan that get-together. Our comfortable surroundings, hearty festive menus and welcoming team create the perfect setting for a quiet, relaxing drink or a Christmas celebration with loved ones. Our festive Christmas lunch (Holly Menu) provides a plentiful festive meal with all the trimmings in the run-up to Christmas and is most suited to those dining at lunchtime. 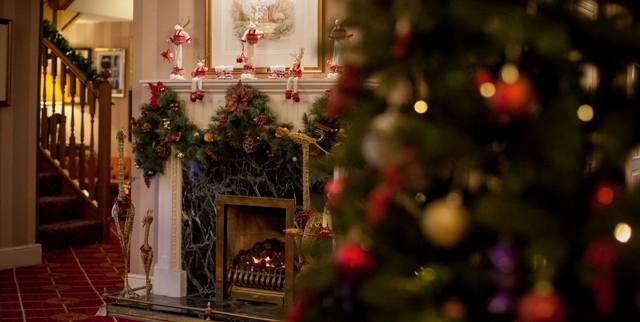 Should you require evening Christmas dining, our Mistletoe Menu would be more suitable. Christmas lunch can be served in our Library, Dining Room and Restaurant or in the spacious Ballroom if you are arranging a larger Christmas gathering. We are closed on Christmas Day and Boxing Day to allow our team to spend quality time with family after a very busy few weeks leading up to Christmas. Festive Afternoon Tea an alternative option but this is only offered on set days in the lead up to Christmas. Both our Festive Tea and Family Lunch include plenty of seasonal entertainment to keep you occupied while you enjoy our sumptuous array of lovingly prepared dishes or sweet delights. We have another full Christmas Calendar for 2019 and hope to see you at one (or more) of our carefully selected dining experiences or evenings of Christmas Party entertainment. For lunch-time dining, we are offering our Holly Christmas Menu from Friday 22nd November until Monday 23rd December (excluding Sundays). This is offered in our Clarkes restaurant for smaller parties or in our Library for private parties up to 20 guests. We close Clarkes Restaurant on Christmas Day and Boxing Day. If you are looking to get married at Christmas our Christmas Wedding Package may be just right for you!